Take Note – Handwriting without using your hand | Ben Cooper :: Group Innovation Director, M&C Saatchi, Tricky Jigsaw :: Co-Founder, O Six Hundred Kayak | A gathering of tweets, blog posts, pins and pictures. Group Innovation Director M&C Saatchi Sydney. Co-Creator O Six Hundred Kayak. Proud father. Loving husband. British. This is our first major project as Engage, Host’s new interactive arm. 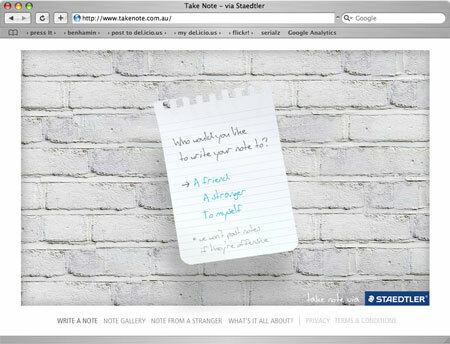 The site is for Staedtler. It connects on and offline through the written word. Inviting site visitors to say something, whether thoughtful or even stupid – by writing a note and sending it on to a postal address within Australia. We then take the notes and hand write them (yep, every single one), on the authors behalf, sending onto the specified address – along with a Staedtler black and red pencil.